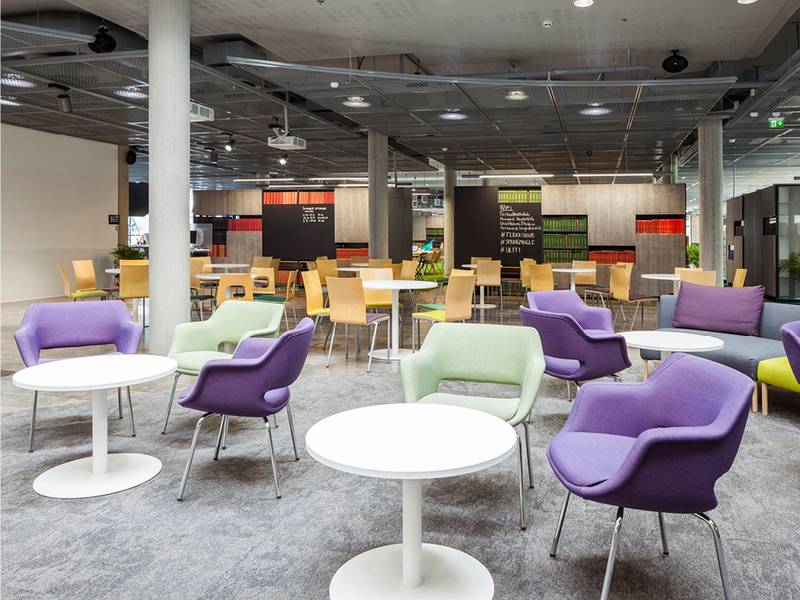 The University of Helsinki and the Helsinki University Hospital HUS ached for a new space concept to cater to the needs of various health and life science community members. This is how Terkko Health Hub was born: it’s an innovation and education centre to promote research and business in the fields of medicine, healthtech and life sciences under one roof with the medical faculty library. For this purpose Gullstén-Inkinen designed interior solutions that support the concept of co-working. How can a library better serve its customers in the digital world? This is what librarians around the world are working on. Public, university and national libraries are all facing the same challenge: printed materials are being reduced, digital collections expand, and the ways in which we use information are changing. These changes challenge libraries to renew their service concepts. 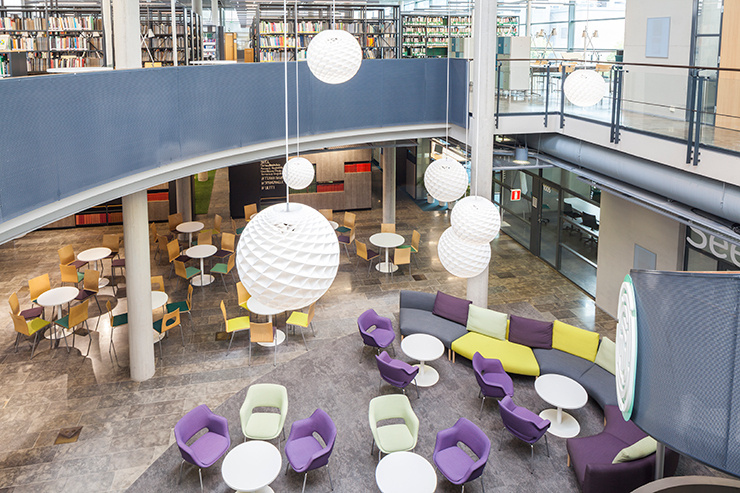 The conceptual development of the Meilahti campus library in Helsinki started a couple of years ago as the library’s print collections faced reductions. Located in the heart of Helsinki’s medical campus, the library provides for the medical students, faculty staff, researchers, doctors, the HUS hospital staff, healthcare professionals as well as many companies in the field. It encompasses the largest collection in health and life sciences in Finland. Previously known as the Central Library of Health Sciences, the building was completed in the corner of Haartmaninkatu and Tukholmankatu in 1998. 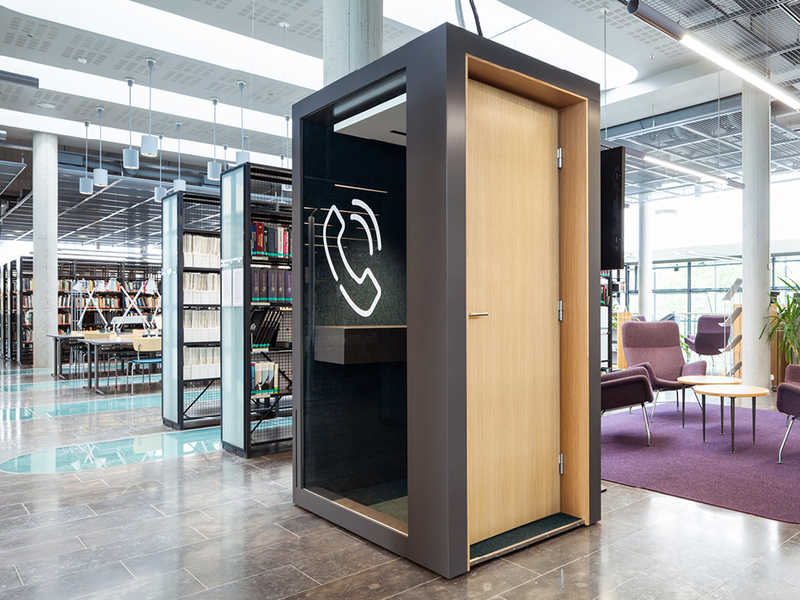 “This library has a central location on campus, and it functions as a kind of gate when entering the hospital area,” says architect Outi Saario representing the University of Helsinki property management department. However, the use of the library had changed since its designed purpose in the 1990s. The materials and their uses have changed. “Medical information has become digital. Medical science develops in leaps and bounds, and there is a flow of new information available. 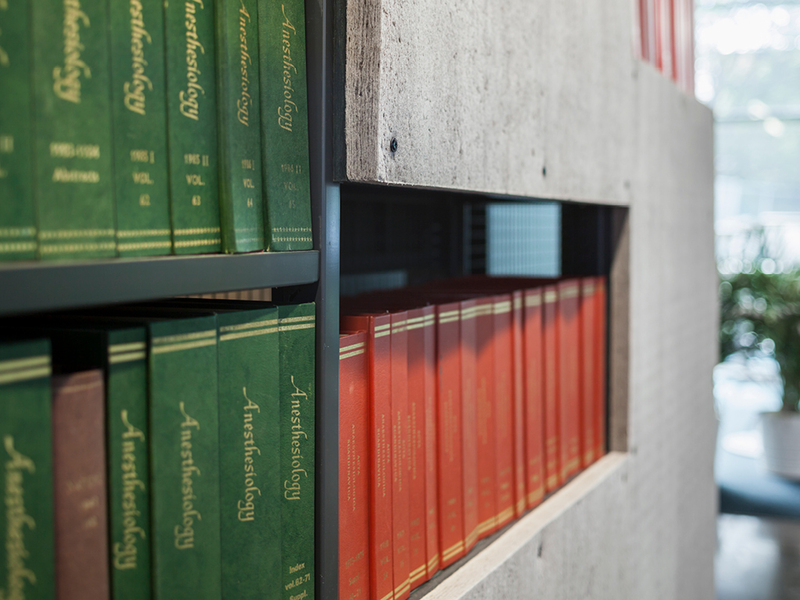 For the library’s operations, this means that printed collections require less space than before. The users of the library find digital collections available for doctors and researchers outside the library, too. It is not necessary to physically enter the library building,” Saario notes. The library turned out to occupy two floors in a great location for just archiving written materials. 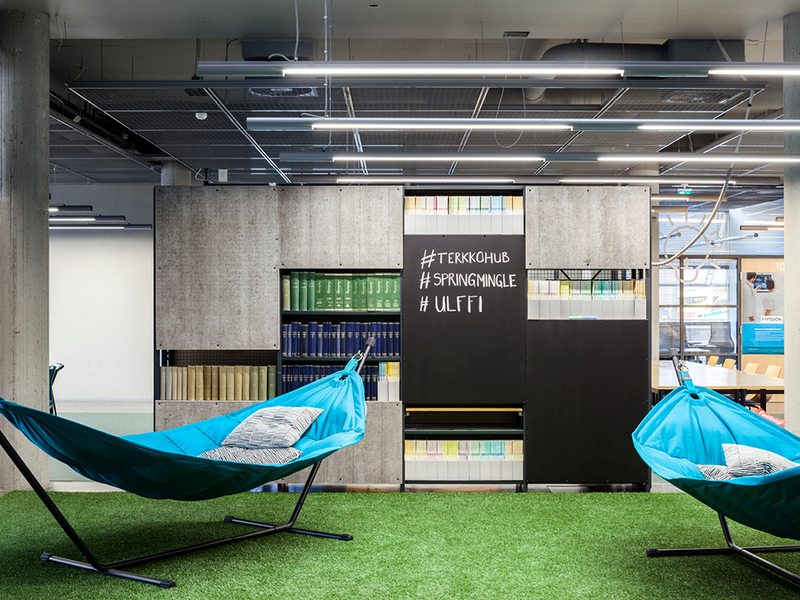 The Medical Faculty of the University of Helsinki and HUS, together with the library, wanted to renew the ways in which the premises were used. They wanted to bring in new customers and life. In practice, the renovation started after the library reduced its collections to free the entire ground floor for other use. The representatives of the University of Helsinki went to the US to find examples of their desired concept. They visited several different co-working spaces in Boston. They also visited MIT and different centres that support science as a business. “The visits convinced us of the possibility to provide co-working space in the library which would serve both the University departments, students and HUS as well as the health science companies. Architect Jarmo Suominen designed the basic idea for the concept,” Saario says. 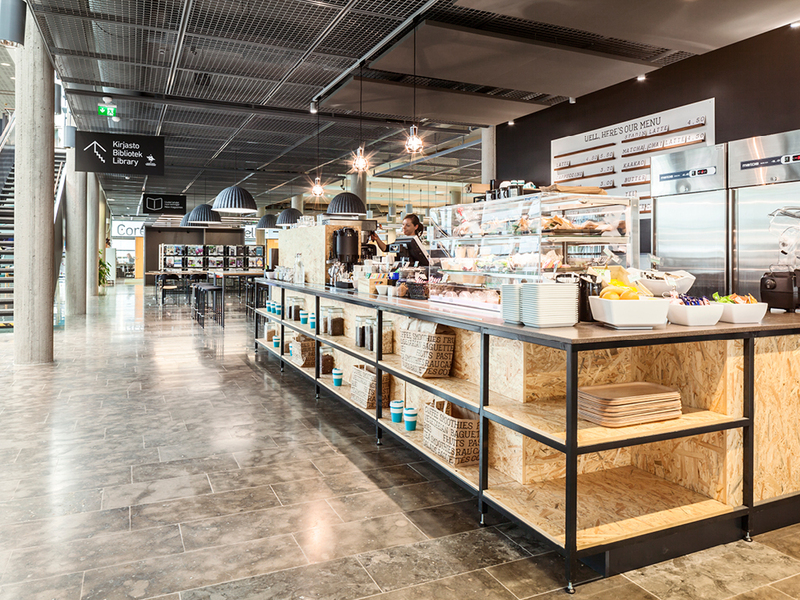 This was the setting for Gullstén-Inkinen to design premises that support co-working. The idea was to place all of the collections, the customer service desks and the reading rooms for the students on the second floor of the building. The new service concept, Terkko Health Hub, was to take place on the ground floor. Another baseline was to utilize the existing furniture of the library and the University. Outi Saario was happy with Gullstén-Inkinen’s initial design ideas. The renovation took place in the spring of 2017. Now there is space for health and life sciences and medical start-ups in the old office wing of the library. There’s an open space that includes several working areas aka “Neighbourhoods” separated with furniture and carpeting. The neighbourhoods can be booked in advance. It was not possible to build floor-to-ceiling partition walls, and therefore a lighter solution was needed. Extra bookshelves from the library now function as partition elements. The shelves have been filled with extra books from the library, and the books organized according to their appearance and colour. 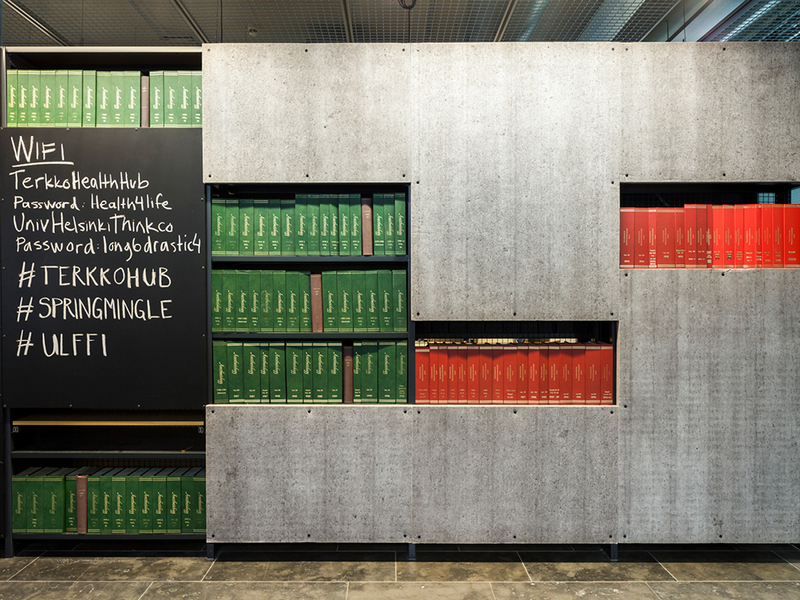 The shelves are backed with acoustic panels made of peat as well as note boards. The shelves also work as wardrobe space for the customers using the neighbourhoods. In addition, it was important to provide open-access areas to support exchange of ideas, networking and events. There is a large lounge-type space, an event square, a cafe area and a green turf with hammocks for this purpose. Outi Saario thinks the resulting hub works really well. Library users have found their way to the new facilities, and there’s a healthy demand for the business premises. The lounge is nearly always full of people, and the hammocks are popular as seats. Feedback is constantly being gathered from the users of the renewed library. The idea is for all age groups to be able to use the premises as they like for their own purposes. “I believe the co-working trend will continue. We are closely following how this space is being used, and we’ll develop the concept further together with the users and Gullstén-Inkinen’s designers. We’re really happy with Gullstén-Inkinen’s passion towards this project and the new ideas they’ve contributed,” Saario says. “The new ways of using libraries are changing the services and concepts everywhere. There’s also discussion about the changing soundscape of libraries. At the moment, libraries struggle to provide both silent space and human encounters and events. Acoustic solutions play an important role in making the concept work. Next year, we’re particularly keen to see what kind of a meeting place the new Helsinki Central Library will become,” Saario notes. Gullstén-Inkinen Design & Architecture is the largest design agency in the Nordic countries specializing in architectural and interior design and real estate renovation. Our award-winning agency provides individualized, cost-efficient and sustainable design solutions for offices, hotels, restaurants, public spaces and real estate renovation projects. We also offer top-quality workplace development services for businesses and organizations looking to foster a better work culture, improve internal communications or boost overall employee productivity.